senioritis blog: Christmas in July! Break out the Eggnog and hang the stockings, Christmas has come early this year. 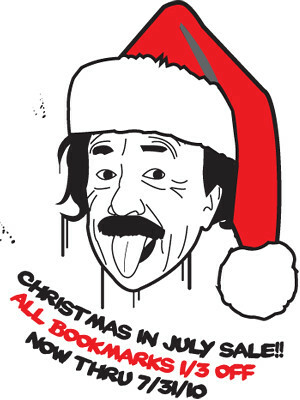 We are very excited to announce our first ever Christmas in July sale! For our first ever Christmas in July sale all of our colorful and inspirational bookmarks will be on sale for 33% off*! The sale will start now (yes, right now!) and will run thru 11:59:59 PM EST on 7/31/10. Whether you're looking for writers, inventors, scientists, or entertainers we've got you covered. What better way to make someone smile during the holidays than to share some unique colorful inspiration that won't break the bank. We gladly ship our bookmarks worldwide so break out the mistletoe and let's get in to the holiday spirit! Please swing by the CIJ section of our Etsy shop to see what's on sale. Any questions about the sale don't hesitate to contact us, info@senioritis.net. Happy holidays! *Our shop prices reflect the sale pricing, there is no further discount. New Location Same Great Taste! Featured Artist :: Studio M.M.E.